Charles Darwin, aided by his son Francis, was intrigued by the movement of plants toward light, a phenomenon called phototropism. In these studies, he tested the canary grass coleoptiles, the hollow sheath surrounding the stem of grasses. The Darwins found that when their tips were covered, the phototropic response was absent. Further study revealed that the coleoptile tips were most responsive to light, while bending occurred in their middle section. The elder Darwin described these results in The Power of Movement in Plants (1880), which laid the groundwork for discovery of auxin, the first plant hormone. While still a graduate student, the Dutch American biologist Frits Went extended Darwin’s findings. Went concluded that the tip contained a phototropic chemical, which he called auxin, and later chemically identified as indoleacetic acid (IAA). In 1927, Went and Nikolai Choladny, at the University of Kiev, independently observed that auxin is a plant growth hormone, concentrated in plants furthest from the light source, on the dark side of the stem. Auxin activates enzymes, the expansins, which weaken the cells in the wall of the stem. The dark-side cells grow faster than those on the light-exposed side causing the stem to move upward toward the light; the Choladny-Went Theory, explaining phototropism, remains controversial. When plants spread out their leaves in daytime, it makes photosynthesis possible. If a plant is placed in the ground on its side, it realigns itself such that its shoots point upward and roots downward. In addition to phototropism, auxin influences geotropism (aka gravitropism) by more selectively building up on the lower side of the coleoptile than on the upper side. This causes the downward growth of plants. Auxin also exerts other growth-promoting effects that influence the amount and type of plant growth. Auxin is produced in the plant tips and moves downward toward the base, causing an elongation of plant cells along the shoots and influencing the branching process. A reduced flow of auxin from the branch tips signals that the branch is not productive, which results in growth resources being redirected to more fruitful branches. SEE ALSO: Land Plants (c. 450 Million BCE), Photosynthesis (1845), Enzymes (1878), Secretin: The First Hormone (1902). Sunflower buds exhibit the phenomenon of phototropism. In the morning, they face the east and follow the position of the sun throughout the day, returning to an eastward orientation the next morning. 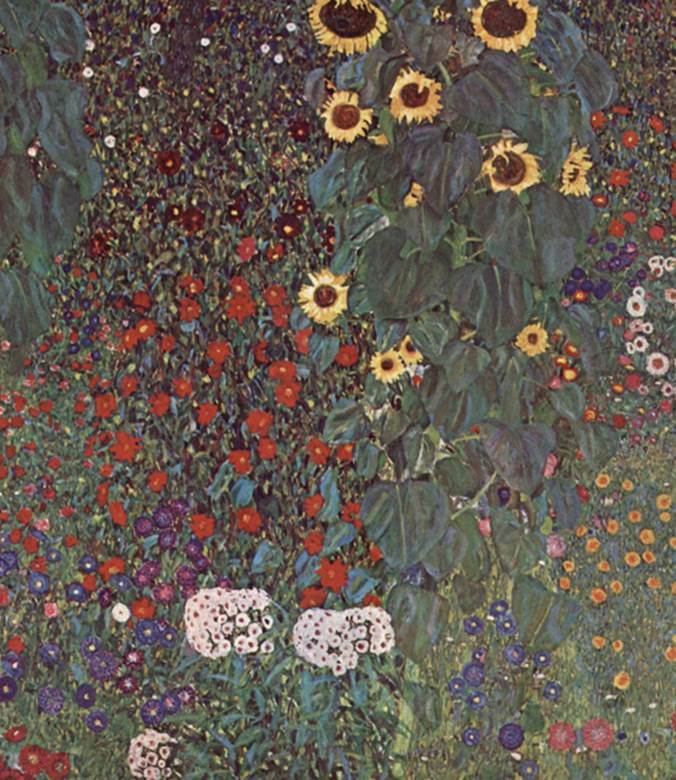 This painting, Farm Garden with Sunflowers (1905–1906), was created by Austrian artist Gustav Klimt (1862–1918).